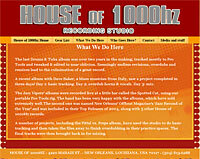 House of 1000hz: Recording studio based in New Orleans, LA. New site for recording engineer Andrew Gilchrist. Brand new site for non-profit group in Beaverton, Oregon to promote their free home repair services, and upcoming fundraising events. New site promoting the Forest Stewardship Council's house design contest using renewable resources for the upcoming GreenBuild 2007 conference.